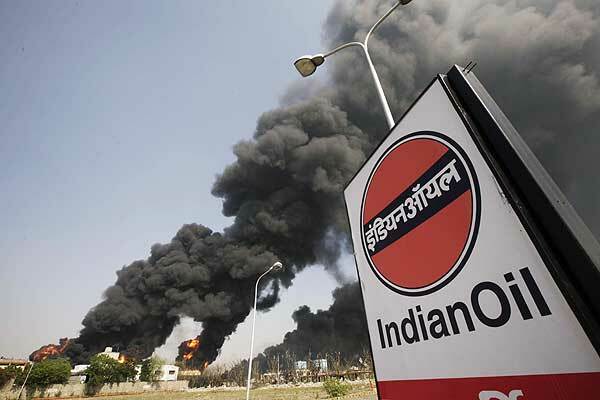 An employee was killed while four others, including a deputy manager, were injured in a blast in the naphtha cracker plant (NCP) on the premises of the Indian Oil Corporation Refinery and Petro Chemical Complex at Baoli village in the district today. The deceased has been identified as Mohan Lal (45), a resident of Bal Jatan village in the district. The injured have been identified as Banuji Sipna (33), deputy manager; Ajay Tiwari (42); Gyan Ranjan Dutta (35) and Sanjeev (30), junior engineer assistant (JEA). All injured were admitted to a private hospital in the city. The condition of Banuji Sipna and Sanjeev was stated to be critical. Banuji has been referred to the Apollo Hospital in Delhi. Besides, another employee Praveen was said to be missing after the incident. Enraged at Mohan’s death in the blast at the refinery, scores of villagers gathered at the gate No. 1 of the IOCL refinery and protested against its management. They also staged a dharna there. According to refinery sources, the employees were engaged in maintenance of a valve in the Swing unit and gas started leaking, causing a high volume blast at 12.50 pm. A major fire broke out in the unit. A team of firefighters of the refinery reached the unit and took out five badly injured persons, including Mohan who died. The sources said that the blast occurred due to a compressor blast in the catalyst plant of the NCP and it blew off the roof of the plant. Propylene gas is used in the plant, which is highly inflammable, they added. “The plant has been sealed and CISF personnel have been deputed there,” added the sources. Meanwhile, DC Verma, Corporate Communication Manager, or any other official did not respond to media queries. Members of the Indian Oil Panipat Refinery Employees Union led by its president Sampooran Singh reached the hospital to enquire after the health of the injured. They said it was not the first incident in the refinery. Safety in the plant was a major issue. Earlier, two contractual employees Anil and Jaspreet died while a production engineer and a contractual labour sustained burn injuries due to leakage in a pipe of the delayed cooker unit on November 17. As the news of Mohan Lal’s death reached his native village Bal Jatan, scores of villagers gathered at gate number-1 of the refinery plant and started protesting. They alleged that the refinery authorities were not maintaining a proper security system in the plant and due to their laxity, accidents were occurring. This was the third accident in the IOCL in the last four months. They demanded a job and compensation for the deceased’s family. Inspector Sandeep, SHO of Madlauda police station, reached the refinery and tried to pacify the protesters who did not budge.